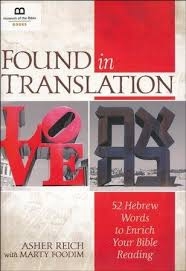 Found in Translation: 52 Hebrew Words | Karmal Books online Christian books and media store. Found in Translation takes a close look at the original meanings and contexts of Hebrew words to offer profound inspirational reflections that encourage a deeper understanding of Scripture. Many Hebrew words have multiple meanings and most Bible translators often select one meaning, usually an English word that best reflects that reference. Written in short, inspirational style, this book explores all the meanings of fifty-two Hebrew words for an enriched, deeper, and uniquely personal understanding of Scripture.